New to the library’s collection is James Patterson’s “Home Sweet Murder”. This Large Print edition includes two true-crime thrillers as seen on Investigation Discovery’s Murder is Forever TV series. MURDER ON THE RUN. The middle-aged housekeeper found dead with a knife in her throat was bad. But the little boy was worse. After a bloody double homicide that puts Omaha, Nebraska, on the map, Detective Derek Mois promises the boy’s parents he will catch the killer, no matter how long or far he runs. Last week’s article incorrectly stated the date for The FRIENDS of the Waurika Public Library Fall Used Book Sale. The correct date for the sale is Saturday, Oct 20th from 10:00 a.m. to 2:00 p.m.. The Used Book Sale will be held at the annex across from the library. We’ll have lots of books to choose from at great prices. Don’t miss it! “Our Day at the Zoo” is a story about children that visit and imitate a variety of animals on a trip to the OKC Zoo and Botanical Garden. The book is available for check out at the Waurika Public Library and patrons that check out “Our Day at the Zoo” will receive one free voucher good for general admission for four people to the Oklahoma City Zoo good through March 31, 2019. Story Time is held every Wednesday at 10:00 a.m. for children and toddlers. Each week we read stories, and have games and puzzles for the children to play with after reading. The Waurika Public Library’s annual Scholastic Book Fair starts Saturday, May 5th to coincide with Downtown Again! At the Book Fair, you will find hundreds of books from new and favorite authors, popular series, cool posters, school supplies, and fun for everyone! The Scholastic Book Fair brings to Waurika a wonderful selection of fun, engaging, and affordable books kids want to read. Giving kids access to good books and the opportunity to choose books will motivate them to read more! Summer is right around the corner! 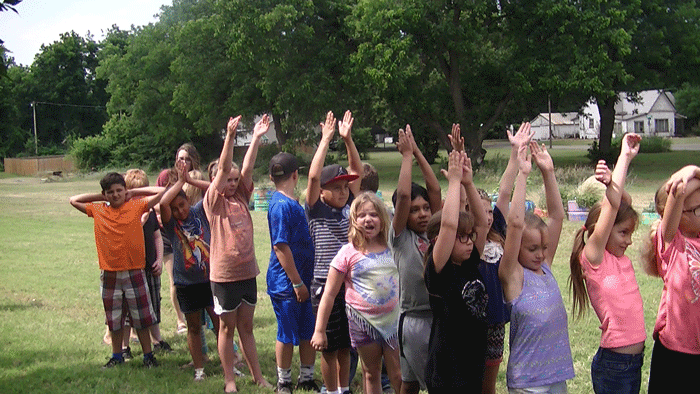 The Waurika Public Library invites elementary-aged children, those who will be entering 1st grade through 5th grade in September, to attend this year’s Summer Reading Program. A variety of weekday programming will be offered and lunch will be provided daily for any school-aged child. The theme this year is Libraries Rock! Programming will run each weekday, June 4-July 27 with the exception of the July 4 holiday. Reading and activities will be from 10:00 a.m. – 11:30 a.m. with lunch served at 11:30 a.m. Children attending the Summer Reading Program must be picked up by their parent/guardian at noon each day. Children must be registered to attend. For more information or registration forms, visit the Waurika Public Library or call 580.228.3274. 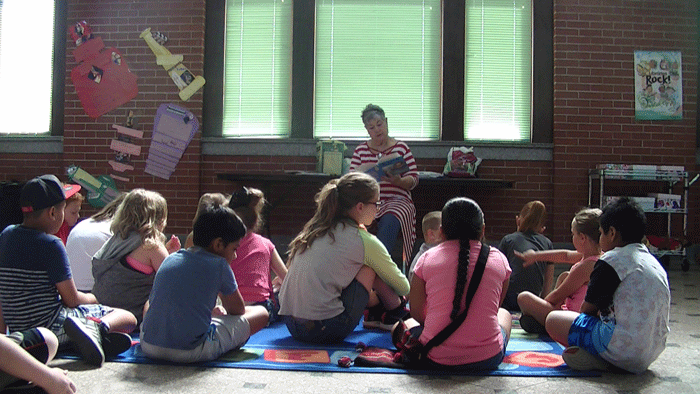 The Summer Reading Program kicked off last week on June 4th. Monday, after DEAR (Drop Everything And Read) time, the kids made banjos. After reading and crafts, it was time for lunch. Thanks to Sonic for providing grilled cheese and tater tots and thanks to Vicki Etheridge and Starr Heron for helping out. Tuesday, after DEAR time the kids made maracas using plastic eggs, grains and spoons. After they finished their craft they went outside to play games finding eggs under cans. 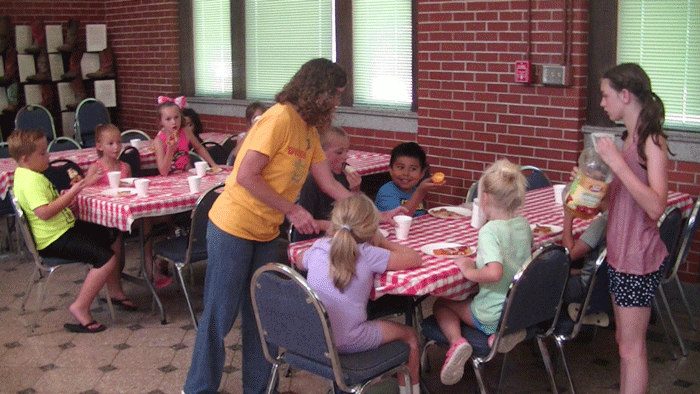 For lunch, Patricia McGriff made hot dogs for the kids served with fruit and chips. Thank you Pat! 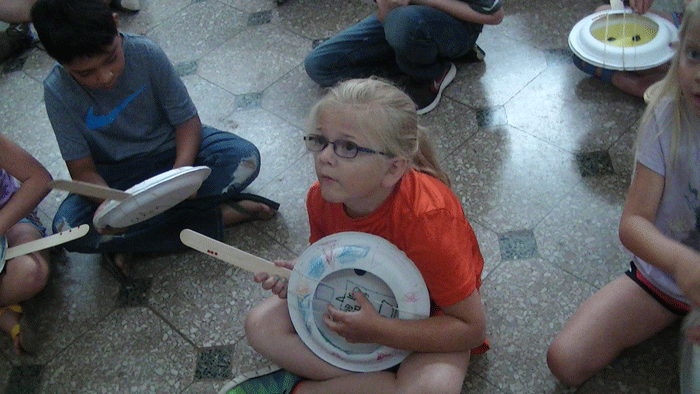 Wednesday, after DEAR time, the kids made kazoos with toilet paper rolls, wax paper, and rubber bands. After making their craft, the kids headed outside to race while holding a pool noodle between their knees. Thanks to Kristie Gaines and her team at the Quick Mart for providing pizza today for lunch. 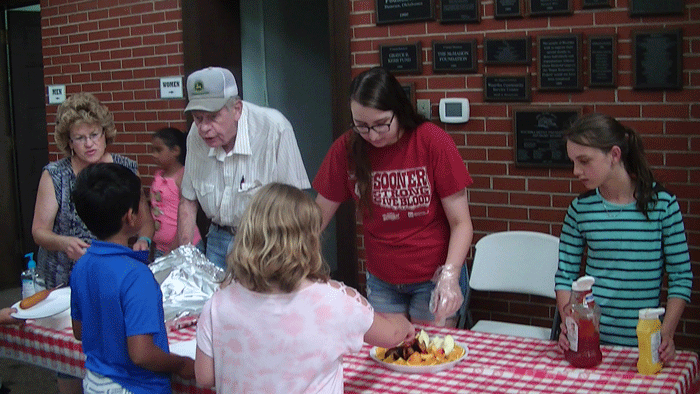 Thanks to the Waurika Lion’s Club for serving. Thursday, after DEAR time, Mr. Hodges, the Waurika band director, came to talk about music and brought a variety of instruments such as a trumpet, trombone, flute and drum. Thank you Mr. Hodges! Mr. Hodes also gave them clackers and tambourines and had them play along while he played the trombone. Next, the kids made harmonicas out of craft sticks. After the presentation and crafts, the kids had lunch. Thanks to Adam Brinson and Jeffco Helping Hands for providing lunch today. Also thanks to Carol Prewitt and Anita Goza-Solomon for helping serve. 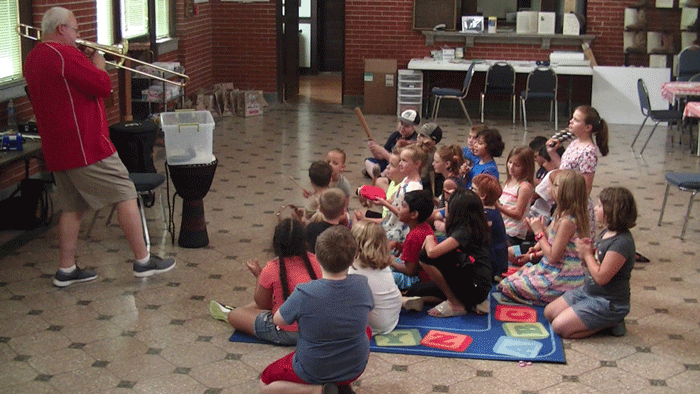 Friday wrapped up the first week of the Summer Reading Program. 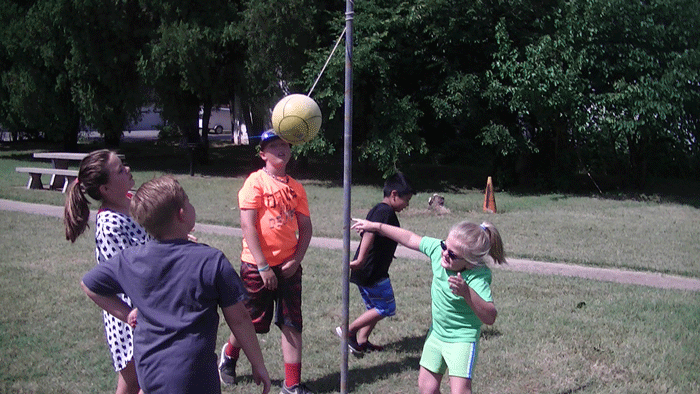 Fridays are park days and after Drop Everything And Read, the kids headed outside for some flavor-ice and play. Once the kids came back inside, it was time for lunch. Thanks to Gary and Lauren Nitschke for providing the meat and grilling hamburgers. Thanks to Carol Prewitt for helping prep and serve. Thanks to Kim Clampitt for setting up activities last week. It was her first time teaching for the Summer Reading Program and she did great! We’ll see her back for Week 4. This week, Ramona Johnson will be here to coordinate the program. Thanks to Karlee Berthiaume for all of her assistance. Thanks to Brittney Helterbran for all of her help. Also, thanks to Destiny Foster and Presley Parker for volunteering this summer. Thanks to all of the people in our community that support this wonderful program. What sort of future do you want? ‘Life 3.0: Being Human in the Age of Artificial Intelligence’ empowers you to join what may be the most important conversation of our time. It doesn’t shy away from the full range of viewpoints or from the most controversial issues—from superintelligence to meaning, consciousness and the ultimate physical limits on life in the cosmos. Don’t forget to use smile.amazon.com to support the Friends of the Waurika Library when you use Amazon. It works just like Amazon with your existing account. When you login, simply choose ‘Friends of the Waurika Public Library’ as the charity you would like to support. Many events and programs at the library are supported by the Friends of the Waurika Public Library. Sponsorship of the Friends starts at just $10. For more information or to become a sponsor, please visit the Waurika Public Library. Week 2 of the Summer Reading Program started on June 11th. Ramona Johnson and Heidi Townsend took over setting up activities for the week. On Monday, after Drop Everything And Read, Ramona talked about the importance of books and then had the kids make their own books using rubber bands and craft sticks to bind them. After reading and crafts the kids went outside to draw on the bricks with chalk while lunch was made. Thanks to Vicki Etheridge and Starr Heron for making and serving PB&J with a side of fruit. On Tuesday, after DEAR time, the kids talked about seeds and growing plants. After the discussion, the kids got to plant some flower seeds in cups. Next, they drew flowers in the books they had made yesterday. For lunch, we thank Dee Goss and her team at Circle D’s for providing corn dogs, french fries and drinks. Thanks to Richard and Patricia McGriff for serving lunch. On Wednesday, Ken Smith and members of the Comanche Masonic Lodge came to help out and donate to the Summer Reading Program. 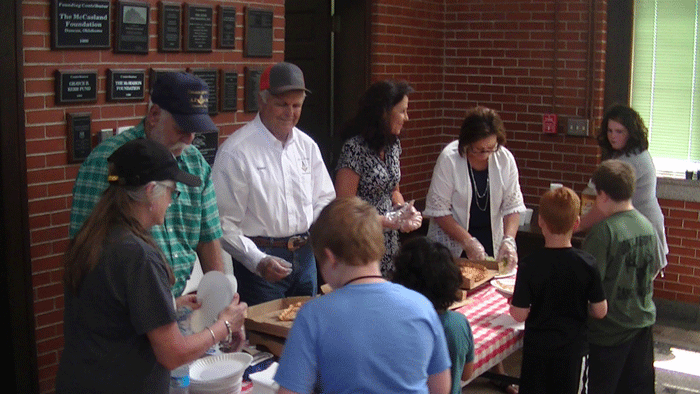 The Comanche Masonic Lodge makes a sizable donation each year that really helps support the Summer Reading Program. After DEAR time, the kids learned about recipes. Then, they added the recipe for Rice Krispies Treats to the books they made. Next, the kids proceeded to make Rice Krispies Treats for themselves. The kids had fun mashing and shaping the treats and of course eating them. Wednesdays are pizza day! 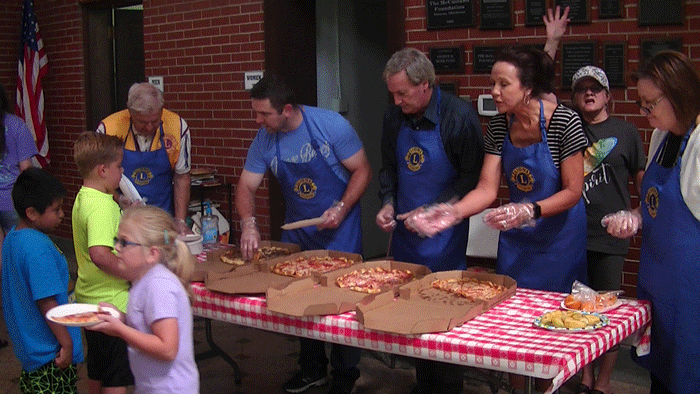 We thank Kristie Gaines and her team at Waurika Quick Mart for providing the pizzas and thanks to the Waurika Lions Club and Comanche Masonic Lodge 41 for serving. On Thursday, after DEAR time, Ramona Johnson read ‘Our Day at the Zoo’ to the kids. ‘Our Day at the Zoo’ is a children’s book produced by the OKC Zoo. The book is part of a promotion by the OKC Zoo giving free passes to those that read the book. Kids attending received free passes to the zoo! If would like free passes to the OKC Zoo, you can come by the library and have your child read the book or read it to them. Ramona Johnson reads to students at the summer reading program. After reading, Madison with the Oklahoma City Zoo and Botanical Garden came to talk about animals with the kids. She also brought along a tenrec, a Savannah monitor lizard, and some Madagascar hissing cockroaches. The kids had a great time. After the visit from the zoo, it was time for lunch. Thanks to Adam Brinson and Jeffco Helping Hands for providing pancakes, sausage, fruit, potatoes and milk for lunch. Thanks to the Waurika Alumni Association for serving. Friday wrapped up Week 2 of the Summer Reading Program. 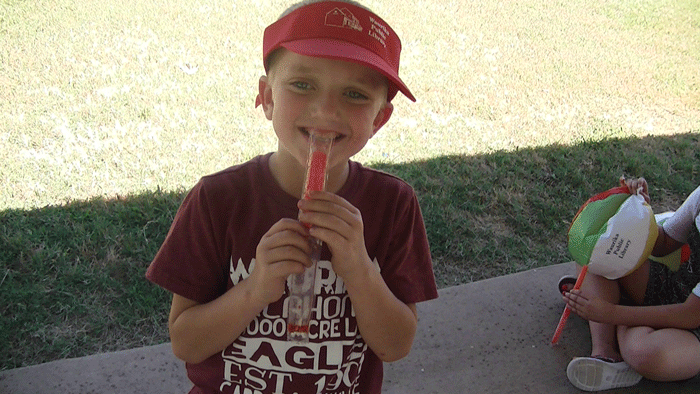 Fridays are park days and after Drop Everything And Read, the kids headed outside for some fla-vor-ice and play. Once the kids came back inside, it was time for lunch. Thanks to the Waurika Fire and Police Departments for grilling hamburgers. Thanks to Carol Prewitt and Melicia McFadden for prepping and serving lunch. Thanks to Ramona Johnson and Heidi Townsend for coordinating this week. 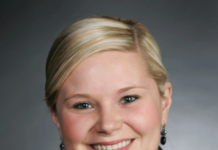 Thanks to Karlee Berthiaume for all of her assistance. Thanks to Brittney Helterbran for all of her help. Thanks to Destiny Foster and Presley Parker for volunteering this summer. The world’s oil supply is vanishing, the stock market is plummeting, and the key to saving the future seems to be a baffling historical mystery. Can the NUMA crew crack it in time? ‘Sea of Greed’ is the suspenseful new NUMA Files novels from the #1 New York Times-bestselling master of adventure, Clive Cussler. With hired killers on his trail, can Kurt Austin locate a submarine that’s remained hidden for more than fifty years? And even if he can, can the biological terror that’s been unleashed be stopped? Check out ‘Sea of Greed’ from the Waurika Public Library. Christmas may be over but you can still use smile.amazon.com to support the Friends of the Waurika Library when you use Amazon throughout the year. It works just like Amazon with your existing account. When you login, simply choose ‘Friends of the Waurika Public Library’ as the charity you would like to support. The FRIENDS of the Waurika Public Library Fall Used Book Sale is less than a month away! On Saturday, October 20th from 10:00 a.m. – 2:00 p.m., we will have a wide selection of used books for sale at the annex across from the library. Proceeds from the Used Book Sale support programs like Summer Reading, Dr. Seuss’ Birthday, Santa’s Workshop and more. If you would like to volunteer for events and programs or make a donation, visit the library or call us at 580-228-3274 for more information. Among the books added to the Waurika Public Library this week is ‘The Strange True Tale of Frankenstein’s creator Mary Shelley” by Catherine Reef. On the 200th anniversary of the publication of Frankenstein, comes this riveting biography of its author, Mary Shelley, whose life reads like a dark gothic novel, filled with scandal, death, drama, and one of the strangest love stories in literary history. Catherine Reef brings this passionate woman, brilliant writer, and forgotten feminist into crisp focus, detailing a life that was remarkable both before and after the publication of her iconic masterpiece. “Today you are You, that is truer than true. There is no one alive who is Youer than You,” – Theodor Seuss Geisel, aka Dr. Seuss. March 2nd was Dr. Seuss’ Birthday. Born in 1904, he would have been 114 this year. Last Thursday, March 1st, the Library welcomed Terral Public Schools grades K-4 to celebrate Dr. Suess’ birthday. I read ‘Ten Apples Up on Top’ before the kids participated in games and activities. 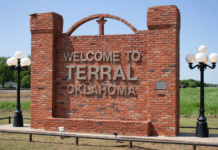 The following day, Friday, March 2nd, the Waurika and Temple Head Starts visited. Thanks to the Waurika FCCLA for helping on Thursday and to Vickie Etheridge and Starr Heron for helping on Friday. Thanks to all of the teachers, parents, and children that attended. The Story Of The Boot was a display of family stories in Jefferson County created to compliment the Smithsonian Institute exhibition at the Rock Island Depot this summer. These stories have been compiled into a hardback book. Copies of ‘The Story of the Boot’ are $25 and take 2-3 weeks for delivery to the library. If you would like the copy mailed to a location other than the library, please add an additional $5 for shipping and allow for an additional week for mailing. ‘Your Hometown’ is a DVD compilation of videos from the local community. The DVD includes the opening of Veteran’s Park, Brickstreet Classic Car Show, Interviews with residents of Jefferson Co. and more! Copies of the DVD are available at the library for $10 with proceeds going to the Friends of the Waurika Public Library. Story Time has a new day! Story Time is now on Tuesdays at 10:00 a.m. Each week, we read stories to pre-k children. After Story Time, we have games, puzzles, and children’s computer games available. If you would like to see Story Time on a different day and time, just let us know. Many events and programs at the library are supported and funded by the Friends of the Waurika Public Library. The Friends have started their sponsorship drive for 2018. Sponsorship of the Friends starts at just $10. For more information, to become a sponsor, or volunteer, please visit the Waurika Public Library. On Saturday, June 2nd, the FRIENDS of the Waurika Public Library are having a used book sale. For $3 we’ll have bags that you can fill with books! DVDs will also be for sale for $1 each. Proceeds will go to help programs and activities at the library. Did you know your Amazon purchases can help support the library? AmazonSmile donates to Friends of the Waurika Public Library Inc when you do your Christmas shopping at smile.amazon.com/ch/80-0811372. Just login with your regular Amazon account and a portion of your purchases will go to help programs like Santa’s Workshop and Summer Reading! In addition to books, the Waurika Public Library has hundreds of movies on DVD and Blu-ray available for checkout. New family-friendly releases added to our catalog this month include ‘Christopher Robin’ and ‘Incredibles 2’. Everyone’s favorite Superfamily is back in Disney-Pixar’s ‘Incredibles 2’! Helen is called on to lead a campaign to bring Supers back, and Bob must juggle the day-to-day heroics of home life. But when a new villain emerges with a brilliant and dangerous plot, the Parrs meet the challenge together with Frozone by their side. Don’t forget, Story Time is held every Wednesday at 10:00 a.m. for children and toddlers. Each week we read stories and have games and puzzles for the children to play with after reading.